Taranaki Base and Hawera are-accredited as Baby Friendly Hospitals - hospitals working within the World Health Organisation's recommended 10 Steps to Successful Breastfeeding. The Baby Friendly Hospital Initiative was launched in 1991 by the World Health Organisation and the United Nations Children's Fund to assist all hospitals to become centres of breastfeeding support. Breastfeeding lays a foundation for a good health in infancy, childhood and into adult life. Maternity hospitals have a special role in supporting the establishment of breastfeeding. The Baby Friendly Hospital Initiative (BFHI) assists all maternity hospitals to become centres of breastfeeding support. BFHI is a World Health Organization and United Nations Children's Fund initiative. BFHI has been adopted in many countries around the world. Where hospitals have been designated as baby friendly, the standard of care for all mothers and babies has been raised, more mothers are breastfeeding their babies and child health has improved as a result. Staff at baby friendly hospitals provide assistance to breastfeeding mothers by adopting practices that protect, promote and support breastfeeding. Staff also ensure that mothers who decide not to breastfeed are provided with information and support. A baby friendly hospital adopts the Ten Steps to Successful Breastfeeding (see below), whilst providing good care before, during and after birth, treating every mother with respect, and supporting her with factual information. A baby friendly hospital also agrees not to accept free or low-cost breast milk substitutes (baby formula), feeding bottles or teats. New Zealand maternity hospitals are encouraged to become baby friendly. 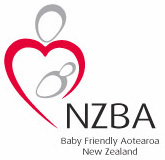 The New Zealand Breastfeeding Authority is responsible for implementing BFHI throughout New Zealand and for awarding certificates of accreditation. Help mothers initiate breastfeeding within a half-hour of birth. Place babies in skin to skin contact with their mothers following birth for at least an hour. Encourage mothers to recognise when their babies are ready to breastfeed, offering help if needed. Practise rooming-in - allow mothers and infants to stay together - 24 hours a day. Give no artificial teats or pacifiers (also called dummies and soothers) to breastfeeding infants. Foster the establishment of breastfeeding support groups and refer mothers to them on discharge from hospital or clinic. Me whai kaupapa here mō te ūkaipō, mō ngā kai mahi Hauora. Me whakapakari i ngā kai mahi hauora i ngā pūkenga, kia whakatinanahia e rātou te kaupapa. Pānuitia ki ngā wāhine hapū ngā painga o te ūkaipō, me te whakahaere hoki i taua kaupapa. Āwhinatia ngā whaene ki te ūkaipō ā rātou pēpi, i roto i te haurua hāora muri tata mai i te whānautanga.I muri tata tonu mai ote whanautanga waihotia pepi kiri ki te kiri ki tona Whaea Te iti rawa hauora kia whakahauhautia nga Whaea kia mohio Te wa pai ki te ukaipo nga pepi, Mehema Hoatu to Awhina. Tohutohu ki ngā whaene, ki te ūkaipō ā rātou pēpi, me pēhea hoki ka mau tonu te rere o te waiū, ahakoa wehe rātou i a rātou pēpi. Tohutohu ki ngā whaene, kia kaua e whāngai ā rātou pēpi ki ētehi atu tūmomo kai, wai rānei, ko te wai ū ānake. Waiho mā te takuta te kī menā ka whāngai ērā atu kai. Me nohotahi te whaene me tōnā pēpi i te ruma kotahi mō te rua tekau mā whā hāora ia rangi. Me akiaki kia whāngai i te wā e tangi kai ana te pēpi. Tohutohu ki ngā whaene kia kaua e hoatu tētehi tūmomo tītī tawhaiwhai, ki ngā pēpi kai ū. Me whakaatu ki ngā whaene kei whea ngā roopu whakahaere ūkaipō mō te wā ka puta rātou i te hohipera. ‘Skin to Skin’ is cuddling Baby close when mother has nothing on her top half and baby is naked or has only a nappy on.